This use of qualified statements by the U.S. and Japan characterizes media discussions on their security alliance, which is why it’s difficult to understand what’s going on. Author Koji Yabe has written several books about the U.S.-Japan alliance, and the latest, “Shitte wa Ikenai 2” (“You’re Not Supposed to Know 2”), was published in November. Since then, he’s been making the rounds to promote it, including a session at the Japan Press Club, but the mainstream media has avoided talking about his findings. Yabe acknowledged this lack of coverage when he appeared on Bunka Hoso’s “Golden Radio” program on Jan. 9, and it’s easy to see why other media outlets don’t book him given the subject he discussed: Why the U.S. Marine Corps Air Station Futenma in Ginowan, Okinawa, is not coming back to Japan. Right now, a replacement air base is under construction in the Henoko coastal district of Nago, and the government’s explanation in the face of local protests to halt construction is that without Henoko they cannot close Futenma, which is in the middle of a city that doesn’t want it. Yabe says there is actually no guarantee that the Futenma air base will close, even if Henoko is completed. Yabe says the agreement with the United States to close Futenma states that it will happen “in 2022 or later.” This “later” is an example of the U.S. military keeping its options open. It may find it still has use for Futenma sometime in the future. Yabe contends that the agreements that legally define the alliance are based on the idea that the U.S. military can change its mind at any time, and the Japanese government thinks it must honor those decisions. Any assurances the U.S. military makes in response to requests from Japan are not, in fact, assured, because in the Status of Forces Agreement (SOFA), concluded in 1960, security matters are to be decided mutually based on the terms of SOFA “and other agreements.” Yabe says one such agreement, nichibei gōdō iinkai gōi, codifies a “joint committee” made up of bureaucrats from both sides who meet behind closed doors to reach decisions that don’t need to be approved by the Japanese legislature. Moreover, the committee has no obligation to publicize those decisions. They can decide anything in secret. This protocol is at play in the government’s recent purchase of Mageshima, an island off the coast of Kyushu, for field carrier landing practice, which, since 1991, has been carried out by the U.S. on remote Iwo Jima island. According to a Jan. 16 report in the Tokyo Shimbun, the proposed field move to Mageshima concerns the residents of nearby Tanegashima, who worry about the noise. The government, not wishing to repeat the problems associated with Henoko, hasn’t said anything publicly about Mageshima. In an article written for the Dec. 9 issue of the Gendai Shinsho online business publication, Yabe says this protocol applies to the Northern Territories issue as well. After clearly stating that the return of all four islands to Japan is impossible, he goes on to say that the government is now trying to make the public believe it is working on the return of two islands in accordance with a Soviet-Japan joint declaration made in 1956. 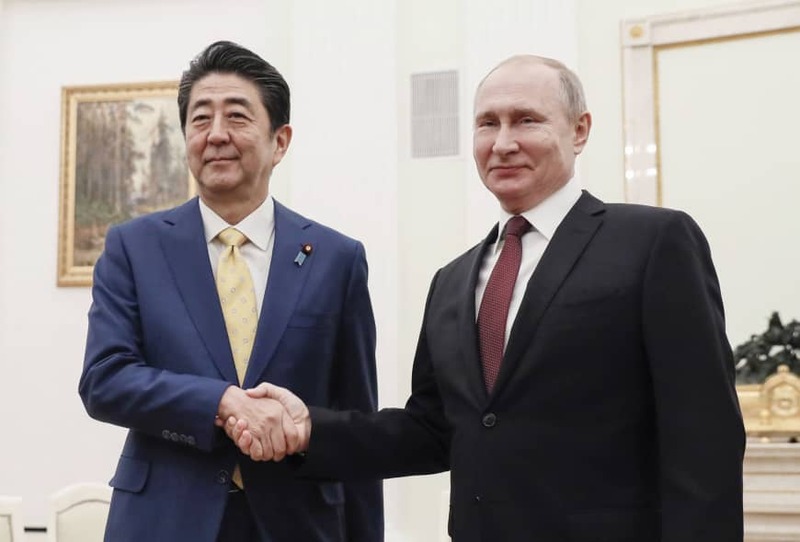 This scheme will also fail because Putin knows that Japan will never secure assurances from the U.S. military that it will not place facilities on the islands if they are returned, a condition that Russia says is non-negotiable. 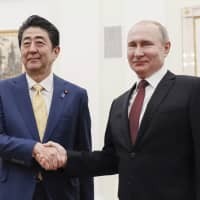 However, Yabe thinks the government, meaning the ruling Liberal Democratic Party, hopes to draw out the negotiations until this June when Abe and Putin are to meet again, so as to convince voters that there is still a possibility of the return of something just before this summer’s general election. In an interview with the Tokyo Shimbun on Jan. 21, Russian Ambassador Mikhail Galuzin dismissed speculation that any of the islands would ever come back to Japan, although he did leave the door open to visa-free access and fishing rights, but only if Japan “adjusted its relationship” with certain parties, meaning, obviously, the United States. As Yabe said at the end of the Gendai Shinsho article, Japan can never negotiate with other countries in good faith about its strategic interests until it changes its subordinate status vis-a-vis the United States. Before it tries to repossess four islands it lost more than 70 years ago, it needs to regain sovereignty over the rest of the country.